A recent post on this blog , “To Hell in a Handbasket”, invited you, dear viewer, to explore Hieronymus Bosch’s deliciously illustrated depictions of debauchery which line the slippery slope to eternal damnation. I thought it only fair to give equal time to the alternate path…to Paradise. Churches throughout the Western world have long employed artists to get their message out to the masses. So powerful a tool was the Churches’s use of the “Poor Man’s Bible” (illustrated versions of the bible on church walls for the benefit of the illiterate masses) that since the the Middle Ages, Churches were happy to fork over the dough to hire the most credentialed artists of their time and region. No finer examples of this kind of biblical story-telling through paint can be found anywhere in the world than in the Byzantine monasteries and churches in northeastern Romania. 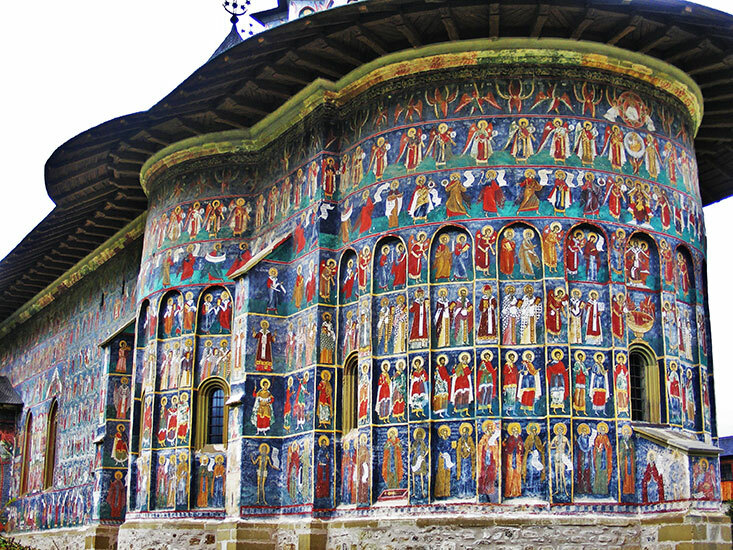 Hmmm, this is making me think I should really do a separate post on Romania which has a treasure trove of unheralded, untrampled, UNESCO heritage sites.To whet your appetite, here is the exuberantly fresco-ed Eastern Orthodox monastery church in the Bucovina region of Moldavia, Romania. The inside is similarly covered, walls and ceiling! But this post is about an even rarer phenomenon: Churches that serve as a palettes for the work of the untrained, “outsider”, or folk artist. I had my first introduction of a modern day folk art church in Somerville, Georgia when I visited the renowned visionary artist Howard Finster‘s Paradise Garden back in 1990. Finster was still alive at the time of our visit, but alas, had taken to sleeping during the day and working at night. So as we walked about the Garden enthralled, Howard Finster was snoring away in some hidden corner of Paradise. Finster turned to painting, sculpting and building as a better way to spread the gospel. A self-described “Messenger of God” and “Man of Visions”, Finster spent roughly thirty years creating his “Paradise Garden” with his “Folk Art Church” as a centerpiece. Though all of his small works of art that could possibly be pried off the sides of his church and other surfaces throughout the garden have now been dispersed, at the time of our visit the church was filled inside and out with works such is this one which showed Finster’s zeal and humor. Though I could describe the folk art church in the Guatemalan highlands region near Xela as more traditional than Finster’s sanctuary, traditional would not be a descriptor usually applied to this incredibly exuberant village church. the exuberant yellow folk art church shows off not only the Guatemalan love of colors but also a joyous mix of Catholic and Mayan iconography. Poking out between the archangel’s legs is the Mayan jaguar. And twin jaguars, the embodiment of Mayan dualities (life/death, day/night, sun/moon) appear at the tip top of the church just above Jesus. The anonymous Guatemalan artist of San Andres Xecul had a kindred spirit in the 19th century French priest, Victor Paysant, who went on a painting spree on the facade of his own church in the village of Menil-Gondouin, Normandy, France. Paysant called his creation the “Living and Speaking Church” and hoped his artwork would beckon parishioners to the righteous path. I cannot find any accounts of how his flock felt about him, but I have deduced that they weren’t so keen on the spectacle that the abbot made of their sanctuary. No sooner had he passed on (in 1921) than the church facade was whitewashed, his decorated statuary inside the church was buried and Paysant’s entire creation was sadly obliterated. However, by the 1980’s the whitewash started chipping away, revealing the hidden treasure to a more receptive public. Thanks to the initiative of Menil-Gondouin’s mayor, Guy Bechet, restoration of the “L’Eglise Vivante et Parlante” was begun in 2004. Now that’s a mayor I could vote for! With the aid of postcards and the excellent memory of a 100 year old resident of Menil-Gondouin, the talented muralist, Hugues Sineux, was able to restore Paysant’s creation. By 2006, with the restoration work was complete, Victor Paysant lives and speaks again.